Der Pz.Kpfw. IV Schmalturm ist ein deutscher premium mittlerer Panzer der Stufe 6. November 1944 stellte die Firma Krupp einige avantgardistische Projekte zur Verbesserung der Bewaffnung der im Dienst befindlichen Panzer und Jagdpanzer vor. Eines sah vor, den Schmalturm des Panthers auf dem Fahrgestell des Pz. IV Ausf. J zu setzen. Das Projekt wurde aufgrund Überlastung des Fahrgestells und der auslaufenden Produktion des Pz. IV aufgegeben. The Pz. IV S. uses the same 7,5 cm L/70 gun as the other Tier VI German medium tanks, but with better dispersion parameters. With 150 mm of penetration with AP, the gun is quite adequate for most tanks it encounters at Tier VI (except the Churchill VII and O-I). However, it will struggle against Tier VIIIs, even with APCR sometimes. It is quite accurate and capable of hitting fairly consistently at medium to long ranges. The gun also has a very low rate-of-fire for the amount of damage it does per shot, resulting in a very low damage-per-minute (the worst of any Tier VI medium), and it will lose in slugging matches against other mediums, especially high DPM tanks like the M4A3E8 and Cromwell. The Schmalturm turret is quite resilient against lower tier tanks, and the gun mantlet and angled turret sides can get ricochets when the turret is pointed directly facing incoming fire. 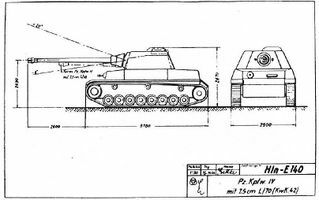 However, the flat face of the turret is only 120 mm thick, and can be penetrated by even some Tier VI tanks. This is a weakness common to all the higher tier German medium tanks in the E 50 line. The hull is very weakly armored by Tier VI medium tank standards, and the sides are only 30 mm thick. A large caliber HE shell to the side is usually fatal. The sideskirts do not count toward the armor model, and have no effect on incoming shells. Diese Seite wurde zuletzt am 25. Oktober 2016 um 13:51 Uhr geändert.